1. Preheat the oven to 190˚C, gas mark 5. Use 5g butter to grease a medium baking dish (about 30cm x 20cm). Slice the top off the garlic bulb horizontally to just expose the garlic cloves. Drizzle with the olive oil then wrap loosely in foil to make a parcel. Roast for 25 minutes, until tender. 2. Melt the remaining 25g butter in a frying pan and add the breadcrumbs and thyme. Remove from the heat and stir well; season. 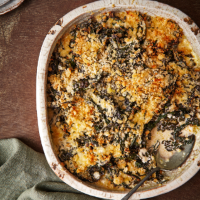 Tear the cavolo nero into bite-sized pieces and pile into the greased baking dish, crushing and bruising the leaves along the way by giving them an enthusiastic massage with your hands (this tenderises them and reduces their volume). 3. Squeeze the soft pulp from the roast garlic cloves into a small saucepan with the crème fraîche, milk and nutmeg. Heat through gently, whisking to break the roast garlic down and distribute it evenly. Season, then pour over the torn cavolo nero, tossing to mix. Press down, scatter with the buttered breadcrumbs, cover with foil and bake for 15 minutes. Remove the foil and cook for a further 25-30 minutes, until golden and bubbling. This recipe was first published in Thu Sep 27 14:41:12 BST 2018.